The "Yes" and "No" camps have been fighting it out in the run-up to Ireland's referendum on the Lisbon EU reform treaty on Thursday, reports the BBC's Yvonne Murray from Dublin. On Saturday, anti-treaty campaign groups gathered outside and unfurled a banner, which read: "People died for our freedom. Don't give it away. Vote No." In front of the banner, three people dressed in gorilla suits danced to foot-tapping music blaring from a portable sound system. "Like the three monkeys, the new Europe will not see you, hear you or speak to you," said Richard Greene, spokesman for the anti-Lisbon treaty Coir campaign group. "If Lisbon is passed, we lose control not only of our taxation issues, but also workers' rights issues and family and social issues. "There's a lot of concern about abortion and other issues like the adoption of children by homosexuals," Mr Greene said. "These are controversial issues, but regardless of what Irish people think, they should be decided by Irish people and should not be imposed by unelected judges sitting 1,000 miles away in a court in Luxembourg." Also campaigning on a platform of national sovereignty is Sinn Fein - the only political party calling for a "No" vote. They say that Irish neutrality would be compromised if Lisbon goes ahead - an argument which helped them defeat the first Nice Treaty referendum in 2001. The Irish government was forced to seek guarantees on neutrality and other issues from Brussels. The treaty was backed in a second referendum subsequently. But it is not just the usual suspects who are against the treaty this time. 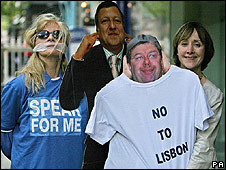 People from all over the Irish political and social landscape have emerged to bolster the "No" side. A group called Libertas - backed by a wealthy Irish businessman - has carried out a well-organised poster, television and internet campaign. The group says the new treaty would usher in European tax harmonisation, jeopardising Ireland's 12.5% corporation tax rate. 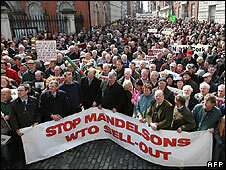 For a time, Irish farmers - usually the greatest supporters of the EU and its Common Agricultural Policy - withdrew their support for Lisbon in protest at plans to cut subsidies as part of a WTO deal, being negotiated by the EU trade commissioner, Peter Mandelson. Padraig Walshe, chairman of the Irish Farmers' Association, said: "If he got his way, it was going to decimate farming not only in Ireland, but right across Europe. "Unless the political leaders of Europe were prepared to rein in Mandelson, we decided that we would have to change our stance on Lisbon". Last Tuesday, the government struck a deal with the farmers, saying it would be prepared to use its veto to block a WTO deal. But it came just a week before polling. All of Ireland's political parties, apart from Sinn Fein, are in favour of the treaty. 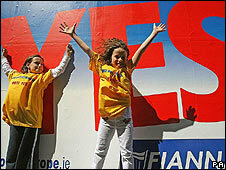 The ruling party, Fianna Fail, has been campaigning hard to counter the claims of the "No" side. Their "Battle Bus" - which has a giant "Yes" painted in red on the side - has been criss-crossing the country, carrying government ministers from town to town in an effort to galvanise the party's grassroots support. "There are a lot of stories being put out," said the Minister for Transport, Noel Dempsey, "that this is going to affect our neutrality - which it's not; that it's going to affect our taxation issues, which it's not; and a number of other issues which are totally extraneous. "You spend the first few minutes of the canvass telling people that a lot of the things being alleged are not actually in the treaty and the next few minutes telling them it's about a more efficient, more effective, democratic Union," he said. But Fianna Fail has been criticised for allowing the "No" side to steal a march on them in the early stages. The pro-Lisbon, Labour MEP Prionsias de Rossa says the government was pre-occupied by the resignation of former Taoiseach Bertie Ahern amid an investigation into his personal finances. "It was clear," he said, "that the debate was polarising around whether we would support Bertie Ahern or not and clearly he had to go. Then the new Taoiseach, Brian Cowen, had to get himself organised. "Unfortunately the 'No' campaigners got out of the traps early with very powerful, but inaccurate information." But it is not those who care deeply about Lisbon who will decide the outcome on Thursday, but rather those who do not care enough or are confused about what they are being asked to vote on. In an opinion poll published last Friday, over a third of voters said they were undecided or were not planning to vote. The latest poll, released on Sunday, puts the number of "don't knows" at 19%. It is these people that the "Yes" camp has just three days of campaigning left to win over. If they fail, the day after voting really will feel for the Irish government, like Friday the 13th. To hear Yvonne Murray's radio report, listen again to The World This Weekend.